The List of purchases provides you with all the purchases that were made in the software. In the List of Purchases, you can view a list of your purchases and print, edit, delete any purchases you have made. Then, click on the purchases icon. From the list of your purchases, you can enter the vendor name or the ID number of the invoice in the search field and the software yield all the invoices related to the search. OR you can search for an invoice manually by scrolling down the list. Select your purchase from the list. Click on the Eye icon from the options above to view the purchase. Click on the print icon to print the purchase. Click on the trash bin icon from the options to delete the purchase. NOTE: By deleting a purchase the items you bought and added to your inventory in that purchase will be deleted and if you payed from your register, you will receive a refund. Add more products: To add more products to the purchase, enter the IMEI code/ name of the product in the item code field then select the product and click the shopping cart button to add it to the invoice. Click save after making changes. 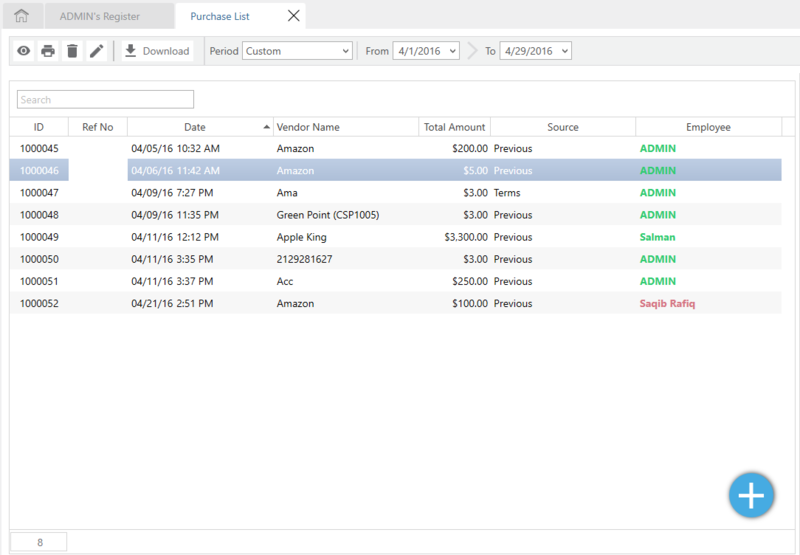 Change the quantity of items: To change the quantity of the items you have added to your purchase, you may click select your item from the invoice then enter the new amount in the quantity field.Click save after making changes. Change the Cost Price: To change the cost price of the items you have added to your purchase, you may select your item from the invoice then enter the new price in the cost field. Click save after making changes. Splitting the value in Cost Price: Splitting the value will split the Tax and/or shipping amount within the cost price of the purchase. For example, if you're purchasing a phone and a charger from a vendor and it cost you $40 and $10 and an extra $10 on shipping or taxes you can enter the amount and split the value in cost price which will divide the amount into however many items you have in your purchase. Since we had a phone and a charger in our purchase, it will divide the $10 we had on shipping based on each product's percentage of the total cost. Therefore, the phone will cost $48 and the charger will cost $12. This will allow you to even-out your purchase based on each product's percentage amount with respect to its total cost.Click save after making changes. Purchase and Vendor notes: You can enter any notes regarding the purchase or the vendor in their respective boxes. These notes will not be printed in the transaction receipts but will be saved in the software.Click save after making changes.